Joanne Herman, a transgender woman who read everything in sight to understand her own gender incongruity, has been helping others with her noncomplicated explanations of transgender for almost a decade. Now she has written down her explanations for all to read in Transgender Explained For Those Who Are Not. "This is a wonderful book. I will be recommending it and in some cases making my own copy available to loan to clients. I like the combination of personal story integrated with sound information, and with excellent references and resources. Information alone can be dry reading, so the personal touch helps hold the reader's interest. 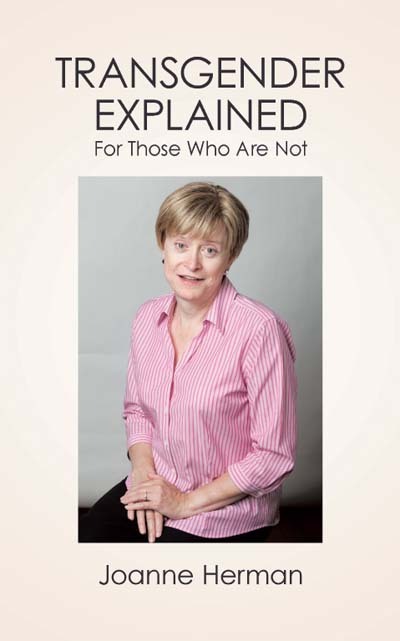 “The arrangement into short articles on specific topics makes it an easy reference resource for a family member or a transgender person who is breaking a path in their own life. Even a therapist who is newly exposed to transgender may find it a useful introduction to the topic. The fact that the book itself is short means that a person who is unwilling to read something lengthier may be willing to read this book and perhaps it will inspire that person to read further on this subject."